Excitement is buzzing around here at The Manor House as our Spring 2013 Bridal Showcase approaches this Saturday, May 11 from 1:00pm-4:00pm! And as promised here we are giving you a sneak peek look at our wonderful vendors featured at this springs’ show! Not to mention, we are taking a look at the amazing giveaways each vendor is offering at the show! That’s right, many of these fabulous vendors have an amazing prize or deal they are giving away only at our bridal showcase this Saturday! So make sure to visit each vendor’s booth to enter into their giveaways! Sneak Peak at The Vendor List & Featured Giveaways for Our Spring Bridal Showcase! We are thrilled to have Heli-Ops joining us at our Spring Bridal Showcase! They will be there with at least one helicopter and will be giving away a 30 minute tour flight for up to three people! Words cannot explain our excitement to have our first ever food trucks featured at this showcase. Not only are they food trucks but they are a pie and cupcake truck named Clementine & Clyde! These adorable & colorful trucks will be joining us and bringing samples of their delicious dessert for your tasting! We are excited to have Memories Photo booth joining us again at this springs’ showcase and are equally excited for their giveaway! Memories Photobooth is offering a 50% off 4 hour rental for a photo booth rental for an event in the Denver Metro area! Once again we are looking forward to seeing Seated Elegance’s chair covers transform simple chairs into extraordinary decor! 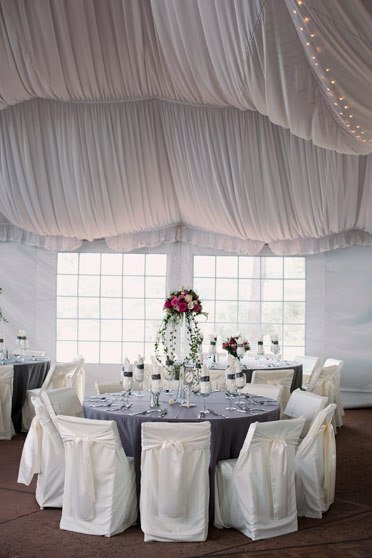 They are also offering an amazing giveaway of 25 free chair covers and sashes for a $100 value! JOINT giveaway- Memories Photo booth & Seated Elegance! We are looking forward to Beach Paradise being a part of our showcase this spring to provide our couples with some fantastic ideas for their honeymoon! They will be giving away a Wheeled Weekender Luggage Bag to one lucky winner! We are very happy to have Mallory Woods joining us at The Manor House again! 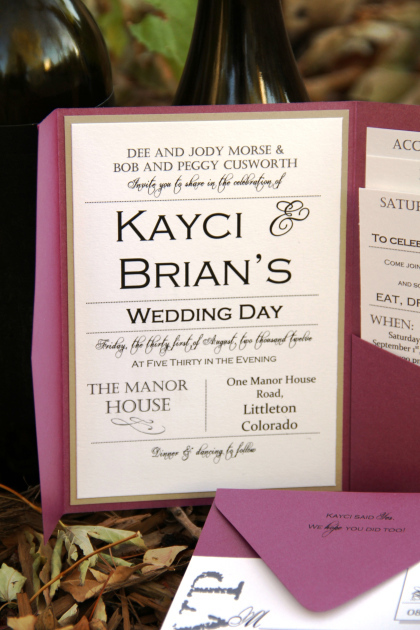 She designed these beautiful invitations below for one of our beloved 2012 couples Kayci & Brian. Like what you see? Make sure to visit Mallory’s booth at the showcase as she will be giving away a set of 100 wedding invitations to a lucky bride! An invite set will include a printed and matted invite, RSVP, RSVP envelope, and mailing envelope. Here at The Manor House we are honored every weekend to be joined by our wonderful caterers, A Perfect Bite! For this Springs’ showcase they will be giving away scrumptious bites of their delicious food! Be prepared for amazing food! Like we said this is just a sneak peak- we can’t uncover everything the vendors are giving away! Be sure to check out all of our fabulous featured vendors at the showcase this Saturday to have a shot at all of the giveaways! Here’s a sneak peak at the rest of the vendors you can look forward to seeing on Saturday! Keep watching The Manor House Bride for upcoming news about our Fall Bridal Show! Hello, I would love to do a site visit! Also when will be your next bridal show? I’m Looking at greeting married next fall.